Filing a patent application in the Indian Patent Office is the first step towards securing a patent to your invention in India. To file a patent application, a set of forms has to be submitted to the patent office. The forms can be submitted online (http://ipindiaonline.gov.in/epatentfiling/goForLogin/doLogin) if you have a class 3 digital certificate. Alternatively, you can send true copies (hard copies) to the patent office. The patent office charges 10% additional fee if applications are filed offline. Why should patent specifications be drafted by patent professionals? Further, we have provided this article for knowledge purposes only. It is recommened to avail services of professionals to file patent applications, as mistakes will prove costly. Thorough understanding of the Indian Patent Act is essential for filing patent applications. Patent agents have understanding of the Indian Patent Act and are the only persons (other than the applicant themselves) authorized by the Patent office to file patent applications on behalf of the applicant. InvnTree employs patent agents. Indian patent offices are located at Delhi, Kolkata, Mumbai and Chennai. The patent application has to be filed in the appropriate office based on your/your company’s location. The table below provides the addresses of the patent offices in India and their respective territorial jurisdiction. Intellectual Property Office, Boudhik Sampada Bhawan, Near Antop Hill Post Office, S.M.Road,Antop Hill, MumbaiI – 400 037. Once you have identified the patent office in which you have to file your patent application, it is now time to get an overview of the forms that have to be submitted. To file a patent application, you will have to submit form 1, form 2, form 3 and form 5. Subsequent to filing these forms with the appropriate fees, you will receive a patent application number from the patent office. You can choose to file form 9 (optional) and form 18 along with fiing a complete application or after filing a complete application. You can download the Indian patent application filing forms. In the table below, the list of forms that have to be submitted and their respective fees is provided. Please note that, the fee mentioned is for E-filing only. The patent office charges an additional fee of 10% over the fee for applications filed offline. * – A fee of 160/400/800/sheet, based on the type of applicant, is applicable for each sheet exceeding 30 sheets in a patent specification. Further, a fee of INR 320/800/1600/Claim, based on the type of applicant, is applicable for each claim exceeding 10 claims in the patent specification. Before reading further, I recommend reading our article “How much does it cost to get a patent in India?” I think it will help you in taking some decisions during the filing process. ​You may also calculate the patent office fee using our cost calculator below: All fee in USD. The Indian Patent office charges an additional fee for each additional page over 30. The total number of pages includes description, claims, drawings and sequence listing if any. The margins requirements are 4 Cms at top, 4 Cms on left, 3 Cms at bottom and 3 Cms on right. Line spacing is 1.5. The Indian Patent office charges an additional fee for each additional claim over 10 claims. There is no restriction on the type of claims. The claims can be independent,dependent or multi-dependent. Only additional fee per claim is charged for each additional claim above 10 claims. The Indian Patent office charges an additional fee for each additional priority document over 1 priority. While calculating the number of priorities, PCT application is not considered a priority. If the PCT application itself is the priority application, then it is considered as a priority application. The deadline to file an examination request in the Indian Patent office is 48 months from the earliest priority date. It is however, recommended to file the examination request along with the application, since the application is queued for examination, only upon filing the examination request. The fee mentioned in this calculator is for the normal examination request. It is recommended to file an express examination request, if the national phase application is filed much earlier than the 31 month deadline. By filing an express examination request, the application is put in queue immediately upon filing the application. If a normal examination request is filed, the application is put in queue for examination only after 31 months from the priority date. Any individual(s) applying for a patent is considered as a natural person. To be considered as natural persons, all the applicant(s) should be individuals. Applicants wishing to claim Small Entity Status, need to provide proof of being a small entity. To know more about this, you can read our article. Get detailed breakdown of cost in 2 minutes ! It should be noted that Forms 1, 2, 3 and 5 can be submitted online. All forms of the patent office can be filed online. An overview of each of the forms is provided below. As the name suggests, this form is an application for grant of patent in India. In this form, you will have to furnish information, such as, name and address of the inventor(s), name and address of the applicant(s), information corresponding to prior patent applications relating to the current invention, which you or any authorized entity has filed, and some declarations, among other information. (Added after receiving comments from Mr. Naren) Please note that a local communication address (address in India) has to be provided. This point is of importance to foreign (Non-Indian) applicants. Form 2 is used to furnish your patent specification. The patent specification can be provisional or a complete patent specification depending of the type of patent application (provisional or complete) you are filing. You might find our article on “What are the different patent filing options?” useful. Note that, if you are filing offline, 2 copies of the patent specification has to be sent to the patent office. Additionally, count the number of sheets and claims (extra fee for more than 30 sheets and more than 10 claims) and calculate the appropriate fee. While counting the sheets, even the drawing sheets will have to be taken into account. Form 3 is used to furnish information/actions relating to patent applications filed in other countries for the current invention. Additionally, any information relating to the rights corresponding to the present patent application has to be furnished. Further, you would be using form 3 to undertake that you will be keeping the patent office informed in writing the details regarding corresponding applications for patents filed outside India. You can read more about this in ourarticle. This application is used to declare the inventors of the subject matter sought to be protected using the current patent application. If this form is not filed, then the patent specification will be published by the patent office after 18 months from the priority date (filing of the first patent application for the current subject matter). On the other hand, by filing this form, you can generally have your patent specification published within 1 month from filing this form. Note that the patent rights start from the date of publication of the patent application (enforceable after grant of patent). This form can be filed within 48 months from the priority date. The patent office will not consider your patent application for examination unless this form is filed. Hence, if you wish to expedite the patenting process, filing of form 9 and 18 at an early stage is advised. A startup can also request for expedited examination of their patent application. The fee for this is INR 8000. At present, the patent office has limited this request to about 1000 request in a year. As a final note, I would advise you to go through our article only for the purpose of gaining knowledge of the patenting process, not as a guide to file patents on your own, since this will lead to adverse affects at a later stage. What are the different patent filing options? I hope this article helps you in filing patent applications in India. The Indian Patent Office publishes patent information on a weekly basis (on Friday each week). This is a public notification, enabling you to take appropriate action if desired. The publication includes published patent applications and granted patents, among other information, for the week of February 11, 2011. Data sourced from Indian Patent Office website by Team InvnTree. The data can be downloaded here and can also be accessed below. I hope you find this data helpful. Check our patent services page to find out if we cater to your patent requirements. Also, feel free to contact us for any information you may require. Are patents always the best way to protect inventions? To answer this question, let us first look at the bright side of patent. If you have a patent granted from your invention, it gives you the rights to exclude others from commercializing your patented technology for 20 years in the country in which it is granted. In other words, it means, you enjoy monopoly over the patented technology for 20 years in the country in which it is granted. This sounds like a great way to protect your invention. However, before drawing such conclusion, let us try to get an idea about the effort involved in getting a patent granted. On an average, it takes ~47 months (identified using a sample of 3191 US patents granted in the year 2011) from the date of filing a patent application to get a patent granted. Patenting is a time consuming process. Patents are territorial. This means, you will have to file patent applications in each country in which you want to protect your invention. You will have to pay a statutory fee to the patent office in each country you file a patent application. Additionally, you will also have to pay the patent consultant who helps you with filing the patent application in the respective country (we once received a quote of $2000 from a Japanese attorney for filing a patent application in Japan). In a nutshell, patenting is an expensive process. Irrespective of all these hurdles, individuals and companies file for patents. In certain circumstances, it makes perfect sense to protect your inventions using patents. However, in my opinion, you should ask yourself some questions before you decide to protect your invention using patents. How easily can my invention be reverse engineered? How easy is it for someone to work around the invention and achieve the advantages provided by the invention? Is the invention attractive enough for someone to copy it? For how many years will this invention be relevant to the industry? How easilycan my invention be reverse engineered? In rare occasions, the nature of invention is such that reverse engineering the same is extremely difficult. In such cases, it is advisable to protect the invention as trade secret. By maintaining your invention as trade secret, you can benefit from it as long as someone reverse engineers it. On the other hand, if you were to protect this type of invention using patents, your protection would be limited to 20 years and to the countries in which you have secured a patent. Additionally, your competitors will get sufficient information from the patent specification, which can be used to work around your invention. Companies often use patent and trade secret protection wisely together to derive maximum benefit. One of the main objectives of getting patent protection is to ensure that advantages of your patented technology are not provided by your competitors’ products/processes. However, in some cases, the nature of the invention is such that, one can easily work around your patented invention, irrespective of how well a patent specification is drafted. In such cases, even if you do get a patent for your invention, you may not essentially gain any significant advantage from that patent. When such is the scenario, patenting may not be the best step forward, especially in cases where money is a concern. However, if you indeed decide against patent protection in the above-discussed scenario, you can consider defensive publication as an option. By adopting defensive publication, you ensure that competitors do not patent obviously-similar technologies and stop you from using such technologies. Well this question, in most cases, is extremely hard to answer. However, if the answer to it is a straight NO, then from a commercial point of view, it may not be a good idea to get patent protection. As mentioned earlier, patents give you the rights to exclude others from copying your invention. 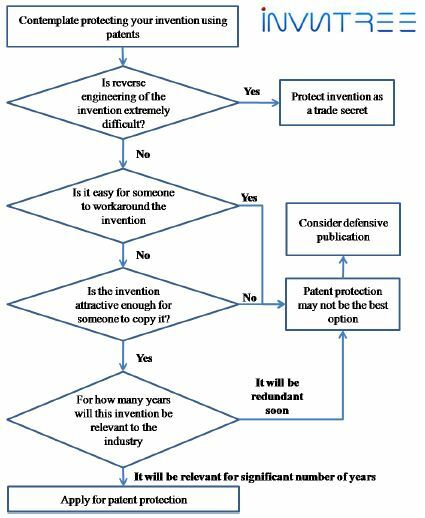 If nobody is interested in copying your invention, then there are very few reasons to get patent protection. However, as in the previous case, if you decide against patent protection, you may consider defensive publication as an option. Some industries are such that certain technologies become redundant within an extremely short span of time. Considering the time consuming nature of patenting process, sometimes the technology you are intending to patent becomes redundant even before your patent application is published by the patent office, leave alone granting of patent. In cases where life span of technology is significantly short, you will have to consider factors such as, the time required to copy your invention by your competitors and potential revenue generation from the patented technology. If your invention is such that, the time required for copying your invention and launching a product based on that technology by your competitors is pretty much equivalent to the life span of that technology, then I see few reasons for patenting. Instead, a defensive publication is a better option. To conclude, one needs to take an informed decision on protecting business interests, be it through patent protection or otherwise. The publication includes published patent applications and granted patents, among other information, for the week of February 04, 2011. I hope you found this article helpful. Check our patent services page to find out if we cater to your patent requirements. Also feel free to contact us for any information you may require. Please note that, the most important factor in filing a patent application is preparing a patent specification. Drafting a patent specification is a highly skilled job, which can be only preformed by persons who have both techinical as well as patent law expertise. If a person or company is serious about protecting their intellectual property, it is highly recommeded to use the services of professional patent practitioners. To know more about this, you can read our article on this here. A provisional patent application is filed to secure a priority date for your invention. A priority date is the date on which the first patent application for your invention is filed. This date is important because, knowledge available in public domain before the priority date is referred to as “prior art”, and this prior art is considered by the patent office to decide if a patent has to be granted to your invention. If you delay filing of the patent application, then naturally, more knowledge in the public domain gets added to the prior art, hence decreasing the probability of patent grant to your invention. Normally, inventors/companies file a provisional application in two scenario. The first scenario is when time is of concern, and drafting a well constructed complete patent specification might delay the patent filing process. This delay in filing, pushes the priority date further, thereby reducing the probability of patent grant to your invention. The second scenario is when money is of concern. Depending on the country in which the patent application is filed, there can be a substantial difference between the provisional and complete application fee that has to be paid to the patent office. Further, depending on the patent consultant you choose to work with, there can be substantial difference in the fee charged by the patent consultant to draft a provisional and a complete specification. Hence, sometimes inventors/companies draft a provisional specification on their own and file the same. The main difference between a provisional and a complete patent application is, a complete application will have a “claim” section, whereas the claim section will be absent in a provisional application. Claims define the scope of your invention and describes what you wish to protect in your invention. It shall be noted that, a complete patent application has to be filed within 12 months from the date of filing the provisional application. Failure to do so will be considered as abandoning the provisional application. Once abandoned, the advantages of filing the provisional application cannot be availed. A provisional application can be filed in the patent office of your country or in a patent office of any convention countries (list of contracting countries – Paris conventional). A complete patent application has to be filed in the patent office of your country if you wish to protect your invention in your country. A complete patent application can be filed in the first place or if you have filed a provisional application provisously, then within 12 months from the provisional application filing date. File a provisional application in any convention country (secure a priority date) and file a complete application in the patent office of your country within 12 months from the priorit date. File a complete application in any convention country (secure a priority date) and and file a complete application in the patent office of your country within 12 months from the priority date. File a provisional application in any convention country (secure a priority date) and file a complete application in each of the foreign countries in which you wish to protect your invention within 12 months from the priorit date. File a complete application in any convention country (secure a priority date) and file a complete application in each of the foreign countries in which you wish to protect your invention within 12 months from the priority date. Filing a PCT application is a good strategy if you wish to protect your invention in more number of countries. By filing a PCT application, you get 30 months duration (sometimes even 31 months depending on the country) from the priority date to file patent applications in each country in which you wish to protect your invention. Note that if you had not filed a PCT application, then you would have only 12 months duration from the priority date to file patent applications in each country in which you wish to protect your invention. Another important point to be noted in case of PCT application is that, only comple patent applications are accepted as PCT applications. Further, a PCT application can be filed in the patent office of your country. File a provisional application in any PCT member country (secure a priority date) and file a PCT aspplication within 12 months from the priorit date. Subsequently, file patent applications, within 30/31 months from priority date, in each country (has to be a PCT member country, list of PCT contracting countries) you wish to protect your invention. File a complete application in any PCT member country (secure a priority date) and file a PCT application within 12 months from the priority date. Thereafter, file patent applications, within 30/31 months from priority date, in each country (PCT member country) you wish to protect your invention. File a PCT application in the first place and secure a priority date. Thereafter, file patent applications, within 30/31 months from priority date, in each country (PCT member country) you wish to protect your invention. It should be noted the patent filing strategy may be constructed on a case to case basis. The filing strategy may depend on business objectives, market conditions and economic constriants, among other factors. This document provides a list of Paris convention contracting states(countries). these countries are also generally referred to as convention countries. The data has been sourced by Team InvnTree. This document provides a list of Patent Co-operation Treaty (PCT) contracting states(countries). These countries are also generally referred to as PCT member countries. You can download a copy here and also access the data below. The publication includes published patent applications and granted patents, among other information, for the week of Jan 28, 2011. Data sourced from Indian Patent Office website http://ipindia.nic.in/ by Team InvnTree.